The 2-Eleven build is completed in dedicated Lotus Sport workshops and each vehicle will be given a Lotus Sport build plate. 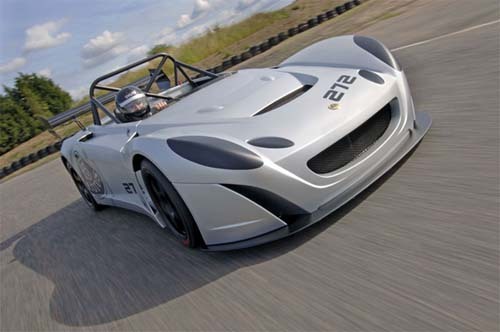 The Lotus 2-Eleven was initially available in Launch Edition specification only in a unique three-way Lotus Sport colour scheme complete with decal pack. The Launch Edition was available in two versions - Road Going Version (UK Single Vehicle Approval) fitted with front and rear lights, exhaust catalyst, single plane rear wing and other items to achieve compliance with UK road legal requirements and Track Only Version with an enhanced aerodynamics package including high downforce single plane carbon fibre rear wing, high downforce front splitter, brake lights and rear indicators and FIA approved driver's race seat. The all new lightweight and high performance track day Lotus The new Lotus "Circuit Car" was announced on Saturday, 11 June 2005 by Kim Ogaard-Nielsen, CEO of Group Lotus, to privileged Lotus Club International members at the annual Lotus Club International Gala Dinner held at Norwich City Football Club. Based on the Lotus Elise Aluminium chassis, and weighing in at approximately 600kg, the single-seater car (with an option of two seats) has been designed and engineered solely for Track Day and Club Racing. The introduction of the new Lotus "Circuit Car" will generate additional exposure of the Lotus brand and provide Lotus with entry to further key market sectors, as Clive Dopson, Managing Director of Lotus Cars, explains "The introduction of this new model plays a key role in developing and enhancing the presence of Lotus Cars on the track, whilst providing the driver of today with a pure circuit car which thrives on the essential values of the Lotus brand. In addition, it will be yet another example of a high quality product to be built at our world class production facilities at Hethel." The prototype Lotus Circuit Car will run for the first time at the oldest motorsport venue in the world, the Shelsley Walsh Hill Climb, during the Centenary celebrations. Based on the strong, stiff and lightweight aluminium chassis first seen on the Lotus Elise, and weighing in at around 650 kg, the single-seater car (with an option of two seats) has been designed and engineered solely for Track Days and Club Racing. The prototype car was designed and built in an incredible eleven weeks and production versions are scheduled to be built from mid 2006 in the world class production facilities at the Lotus headquarters in Hethel Norfolk. The visually dramatic open-topped prototype Circuit Car has lightweight composite bodywork and a very powerful supercharged and intercooled 1.8 litre engine. The innovative and technologically advanced extruded and bonded aluminium chassis has high side sills that reduce the complexity of the chassis structure. The engine with VVTL-i (Variable Valve Timing and Lift  intelligent) is mated to a Roots-type Eaton M62 supercharger with air-to-air intercooler to give a maximum power output of 243 hp (181 kW) at 8000 rpm and a maximum torque of 174 lb ft (236 Nm) at 7000 rpm. On production versions, an entry-level naturally-aspirated VVTL-i engine will also be available with 190 hp (141 kW) at 8000 rpm and 138 lbft (181 Nm) at 7000 rpm. 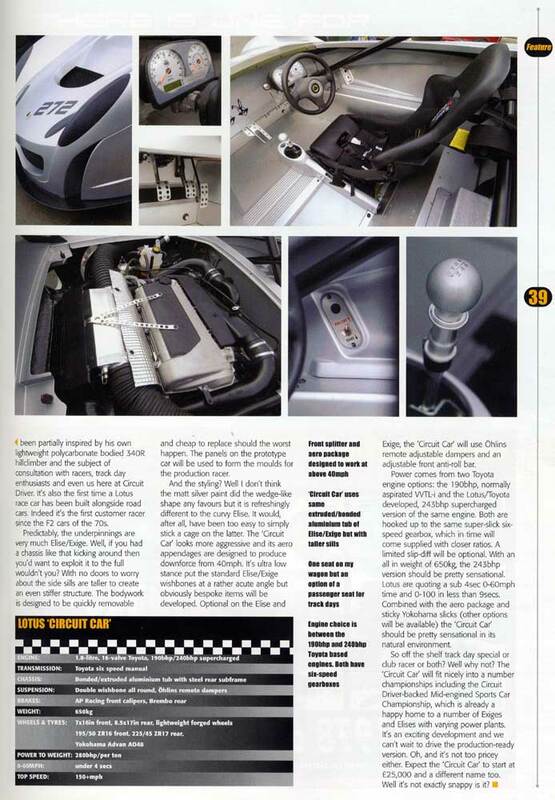 Engine management control is provided by the bespoke - mapped Lotus T4 system and a drive-by-wire electronic throttle. The 6-speed C64 close ratio gearbox is linked to an open slip differential and a prototype traction control system perfect for the tight and twisty Shelsley Walsh Hill Climb course. The power to weight ratio, of course a key Lotus engineering principle and core brand value, for the supercharged engine is around 373 hp/tonne (278 kW/tonne) with a torque to weight ratio of 267 lbft per tonne (363 Nm/tonne). It is estimated to achieve the 0  100 mph (160 km/h) sprint in less than 9.0 seconds. This exciting combination has allowed for a dynamic racing package producing higher performance to that of existing Elise-based products, powering the car from 0  62 mph (0  100 km/h) in under 4 seconds. Braking is provided by a servo-assisted, track tuned 4-channel Antilock Braking System (ABS) with Lotus/AP-Racing twin-piston fixed aluminium alloy front brake calipers, Brembo single-piston sliding rear calipers and 282 mm diameter, 26 mm thick front and rear, cast-iron ventilated &cross-drilled discs. The lightweight GRP composite bodywork is bolted to the chassis for easy removal for maintenance and race / track preparation. 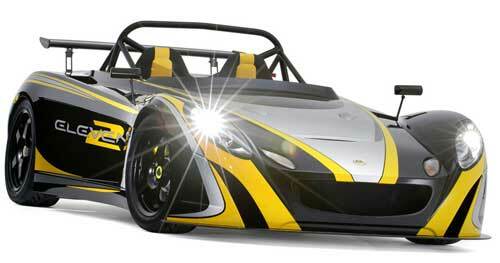 The bodywork has been designed by the Lotus Design team led by Russell Carr, Chief of Design for Lotus. Russell Carr, explains the design philosophy of the new Lotus Circuit Car: The design captures the essence of the other Lotus based products and combines it with a functionally correct bodywork to give a racecar that is not only beautiful to look at but aerodynamically and structurally as effective as it possibly can be, The small frontal area with no windscreen is combined with flat, unsculptured sides with no airintakes, for minimal drag; and a deep front splitter and a large rear wing (single plane as standard and dual element as an option) and a rear diffuser to attain maximum aerodynamic downforce. 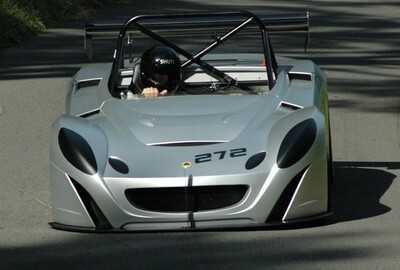 For the Shelsley Walsh Event, the Circuit Car uses Lotus Sport 5 spoke forged wheels, which are shod with Yokohama A005 Hill Climb specification racing slicks (Yokohama A006 racing wet tyres are an option). For production versions, other tyre options will also be available. Suspension and damping is provided by fully independent unequal length wishbones, Eibach coil springs, Ohlins 2-way adjustable dampers and an adjustable front anti-roll bar. 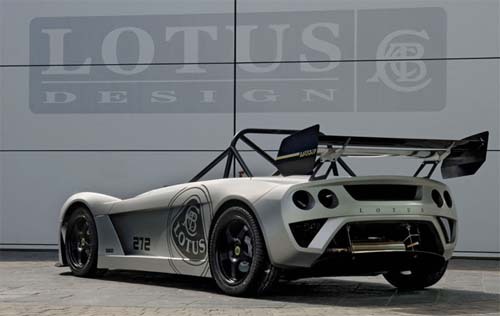 Tony Shute, Head of Product Development at Lotus Cars will be driving the Lotus Circuit Car for its premier at the Shelsley Walsh Centenary celebrations. Tony explains what makes the Lotus Circuit Car a leading high performance track car: This new product has allowed Lotus to once again apply its key performance through lightweight philosophy. 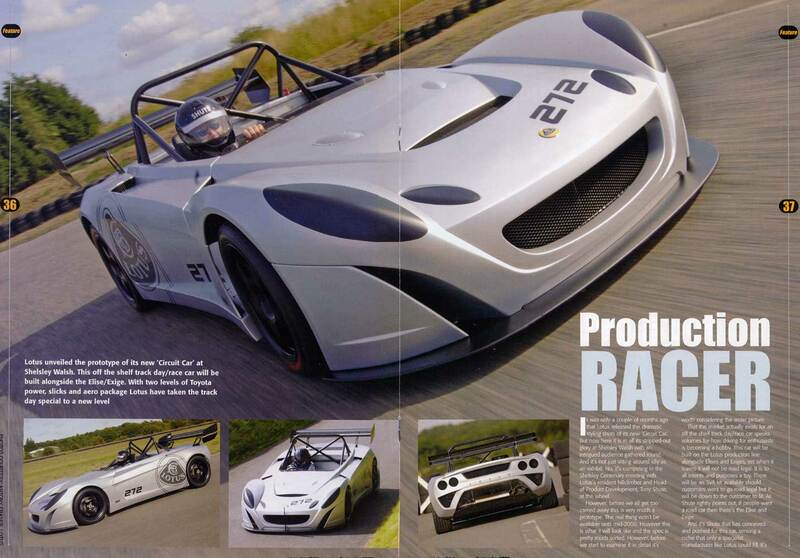 This is in order to achieve an innovative product for the track day and club racing Lotus enthusiast whilst staying true to the key design attributes of the Elise and Exige products. 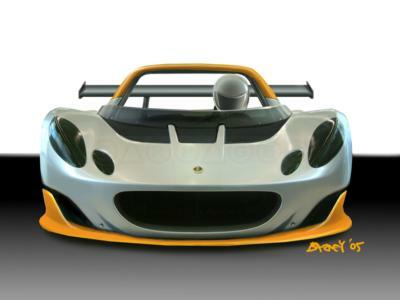 They are considered to be amongst the finest existing road and track day cars by thousands of owners around the world, and the Circuit Car will build on this formidable reputation, helping to further underline Lotus as the ultimate drivers choice. The Lotus Circuit Car is scheduled to go on sale by mid 2006 with volumes of approximately 100 units per year. The name of the Circuit Car and the Manufacturers Suggested Retail Prices will not be confirmed until closer to production but it is expected that the production versions of the Lotus Circuit Car will start at around £25,000 for the 190 hp version in the UK. Prices in other markets will be release over the next few months.